This GPS Child Locator comes with all the basic functions that are needed to track your kid and is affordable for smaller budgets. We’re talking about the Sourcingbay Mini GPS Child Locator . Track your kid or teen with this futuristic looking portable child tracking device combined with app on your phone. The portable Sourcingbay GPS for kids easily fits in your child’s bag or pocket. Or use it as a car tracker to track your teen’s whereabouts. This gps child locator is for you if you want a basic and well functioning tracking device for kids that can also be used for other purposes (now or later). 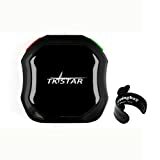 This portable GPS tracking device doesn’t need a paid monthly service plan so you can track your kid in an inexpensive way. – SOS tracking device– This gps child locator has an emergency button so your child can instantly reach you in case of emergency. – Easy to use with pre paid standard SIM card – Once you have received this gps tracking device for kids, buy a sim card. This is necessary for all gps trackers since they use the cellular network to locate your child through gps. – No extra monthly fee to track your kid – In order to use gps tracking devices for kids you often need to pay a monthly service fee. This is not the case for this kid tracker. Of course you need to pay for the sim card use. – On top this wearable works worldwide – Yes, buy a sim card in your country and start tracking. The Sourcingbay GPS child tracking device works well if you are looking for a good inexpensive tracking device for kids. If you demand the highest possible accuracy and are using android, the little bit more expensive SkyNanny Child Tracker is an even better pick (see our review on Sky Nanny GPS for kids ) to track your kid. The Trackimo tracking device for kids is another good (and cheap) pick, but comes without SOS button (see our review on Trackimo child locator ). If you can’t decide yet, consult our comparison guide on portable tracking devices . Or check out our selection of other wearables, namely best quality GPS watches for kids and GPS bracelets for kids . 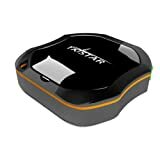 This portable GPS tracking device for kids, or cars or other valuable items, has a lot of extra wiring, that can be used to apply the gps tracker as a car tracker . However, you don’t need all of that, and can leave some wire uninstalled. The tracking device will still do what you bought it for: track your kid and ensure maximum child safety . The Sourcingbay gps child locator is ideal if you want to track your kid on a smaller budget . This child tracker has an app for iphone and android. The Sourcingbay GPS Child Locator is a waterproof Mini GPS Tracker with positive reviews regarding child safety . Get the Sourcingbay gps child locator and track your kid or teen to ensure maximum child safety . Compare with our guide for portable GPS tracking devices . Or do you feel more for a GPS watch for kids or teens or a GPS bracelet for kids ?